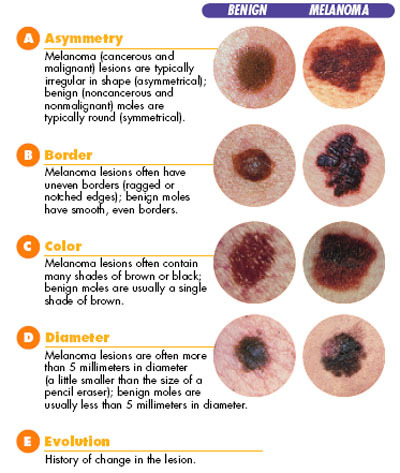 Melanoma: The most dangerous form of skin cancer (that is highly curable when detected in its earliest stages & treated). Of the 1 million new cases of skin cancer that will be diagnosed this year in the US, approximately 88,000 will be melanoma. It can occur on any skin surface! It begins in the type of skin cell called a melanocyte. As part of the tanning process, these skin cells produce large amounts of skin pigment or melanin, to help protect the skin from burning. The main cause of melanoma appears to be related to excessive UV (ultra-violet) radiation exposure. Severe childhood sunburn. Protecting skin during the first 18 years of life reduces the risk of some types of skin cancer by up to 78%!! You can get a sunburn even on a cloudy day! Up to 80% of the sun’s rays can penetrate light clouds, mist, and fog. Snow reflects the sun like a mirror. Fresh snow reflects nearly 90% of the sun’s rays. You can burn while you’re in the water! Water reflects 8% of the sun’s radiation. Dry surfaces reflect some of the sun’s rays. Concrete reflects up to 85% of the sun’s rays. Just one sunburn can increase your chance of developing skin cancer by 50%! 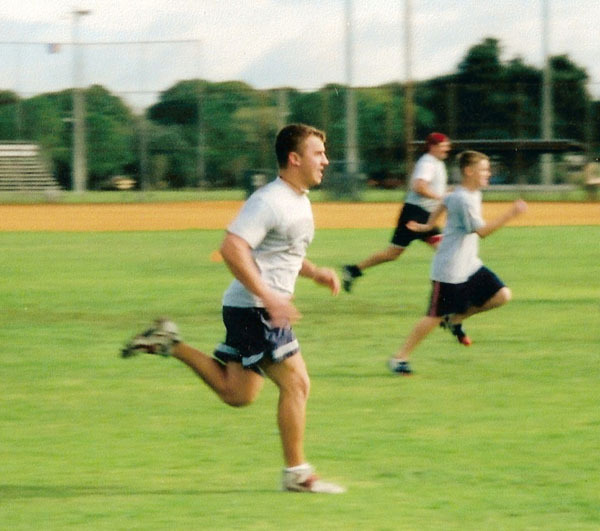 Protect yourself during any outdoor activity with a sunscreen that has an SPF of @ least 15. Sun’s peak hours are 10am- 4pm. Apply sunscreen 15-30 minutes before going outdoors to allow penetration into the skin. Reapply after 2 hours. The Philip A. Bryant Melanoma Foundation is proud to support the H. Lee Moffitt Cancer Center & Research Institute for the research & treatment of melanoma. Research continues to teach us more about melanoma. Scientists are learning more about its causes. They are exploring new ways to prevent, find, and treat this disease. Because of research, people with melanoma can look forward to a better quality of life and less chance of dying from this disease. Although it accounts for only about 5% of all skin cancers, melanoma is the leading cause of all skin cancer-related deaths – approximately 74%. Accepted @ the Fifth World Conference on Melanoma, Venice, Italy, 3/2001. The black stripe is to remind us of the disease and to mourn the one person who dies every hour from melanoma just in the USA alone. Intertwined with the white stripe that signifies the hope for the cure! Melanoma Awareness Ribbon copyrighted 1997 by the William S. Graham Foundation for Melanoma Research, Inc.